Issues and Sustainability. What you need to know. 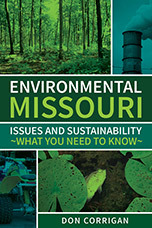 Environmental Missouri is the first comprehensive guide to local and state environmental issues involving the air we breathe, the water we drink and the land we inhabit in the Show-Me State. This collection of green issues is very serious, and yet intensely readable, as it examines such issues as urban sprawl, polluted streams, radioactive waste, lead contamination, airborne mercury, ozone and smog, noise and light pollution. The book raises questions about wildlife issues: What’s with the Asian Carp taking over our rivers? Why are the bees disappearing? When will the Ozark Hellbender revive and thrive? Environmental Missouri is not all bad news and pessimistic prose. A final chapter on sustainability looks at how Missourians are going green, whether it’s with cloth diaper parties, raising backyard chickens, farming responsibly or hosting green burials at trail’s end. Each chapter includes a Q&A with a habitat expert or environmental activist to give a unique perspective on the issue at hand. Environmental Missouri argues that we should teach our children well; instead of trying to sweep problems under the rug, it’s time to tackle them head on and guide the way to a more sustainable future. Don Corrigan is a long-time journalism educator at Webster University in St. Louis and well-known weekly newspaper editor and writer. 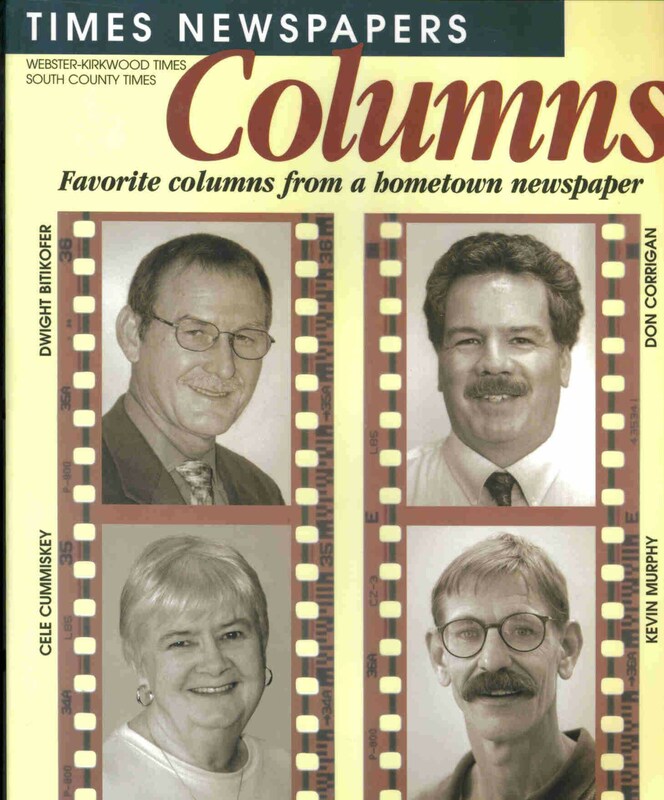 In addition to his extensive international travels, he has produced award-winning outdoor and environmental books and articles, as well as garnered Messing, Kemper and College Media Association excellence in teaching awards. He directs the Outdoor/Environmental Journalism Certificate at Webster University, which has brought him recognition from the Society of Environmental Journalists (SEJ) and a distinguished achievement award from the Great Rivers Environmental Law Center. If nasty weather counted as a criminal offense, then the number of felonies committed in the Missouri region would be quite simply mind-boggling. Crimes from the skies would result in a rap sheet beyond the ability of mere mortal meteorologists to compile – and the antics of Jesse James and his outlaw band would soon be forgotten. Enter the pages of “Show-Me… Nature’s Wrath” and you will soon find yourself experiencing the horrors of destruction wrought by freak hail storms and fatal lightning bolts. This weather compendium is packed with tales of supercell tornadoes smashing into towns large and small – from as far back as 1880 and as recently as yesterday. Also included are the alternating calamities of drought and flood, as well as the blizzards and ice storms ushered into Missouri by winter’s winds of Thor. 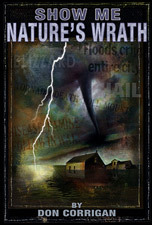 With prose accounts by journalist Don Corrigan, and with detailed photo illustrations and newspaper front pages recalling the worst that weather has to offer, “Show-Me… Nature’s Wrath” is at once a historic chronicle of the forces of nature and a prized keepsake. With images and lyrical descriptions of dozens of incredible weather events in the Show-Me-State and adjacent areas, this is literally a book for all seasons. You don’t have to be a climatologist to get a thrill out of the thunder and lightning in “Show-Me… Nature’s Wrath.” This book is a great classroom book for youngsters studying weather, as well as a unique armchair book for oldsters trying to recall the details of the storm of their lives. To paraphrase Missouri’s Mark Twain, this is a great book for those who don’t quite know what to do about the weather, but who sure enjoy talking about it. In short, it’s for everybody. Both expert and novice outdoor enthusiasts will enjoy a new book, “Show-Me… Natural Wonders,” by author Don Corrigan with pencil line Illustrations by artist Ed Thias. “Show-Me… Natural Wonders” is an escape manual – a guidebook to special places right in our own backyard. Enter the pages of this unique guide and you will soon find yourself hiking up tall bluffs; scrambling along the banks of springs and streams; descending into the underground wilderness of Missouri’s many caves; or simply kicking back for a rest on a 500-million-year-old boulder in a country glade at sunset. “Show-Me… Natural Wonders” invites readers to celebrate their own special places. Enjoyment of natural wonders should not be a passive, spectator sport. One of the book’s missions is to inspire folks to get active. Take a hike in the wondrous, natural asset of Roger Pryor Forest. Try out a mountain bike on the popular Chubb Trail above the Meramec River. Grab a paddle and enjoy the Vilander bluffs or the Devil’s Elbow Bluffs or Cardareva Bluff while canoeing Missouri’s many fine rivers. An appendix includes clearly-explained directionson how to find the Show-Me-State’s Natural Wonders. In addition to his nature writing with “Show Me… Natural Wonders,” Corrigan is at work on a new nature exploration for Reedy Press entitled, “Show Me… Nature’s Wrath,” slated for publication in Fall 2008. Longtime St. Louis professor and newspaper editor Don Corrigan has published a scathing critique of the public journalism movement in America. 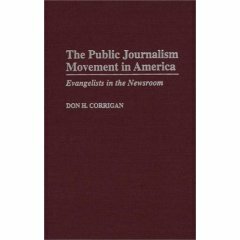 “The Public Journalism Movement In America: Evangelists In The Newsroom” takes a hard look at the movement, sometimes referred to as civic journalism, to reform journalism practices in both print and broadcast. • Investigate. Make people mad. Write about outrages and injustice. • Tell us things the authorities don’t want us to know. • Make us laugh. We don’t have to be serious all the time. • Turn writers loose. Spend less time agonizing over the product. • Liberate the op-ed pages. Let the people have a forum. • Start looking at the product and stop squeezing the bottom line. Evangelists In The Newsroom,” is available at amazon.com. Author Don Corrigan broke into journalism in the late 1970s job as the first male writer on a daily newspaper’s “women’s pages.” His articles about the experience have appeared in several magazines and he has lectured on the topic of gender and the news media. His articles became the basis for a chapter in the book, “Journalism Stories From The Real World,” published by North American Press and edited by Rheta Blaney. “On the afternoon I left Living Today, my editor apologized for some of the treatment I had received at the hooves of the chauvinist pigs on the paper. I assured her that no irreparable harm had been done, and that I looked on much of my ordeal as humorous. At that point, she looked at me with great disappointment, as if I were part of the problem and not part of the solution to the status of women in journalism. She reminded me, that as a male, I could take the second-hand treatment on the women’s pages more lightly, because the escape hatch was always open for me. Blaney’s book, “Journalism: Stories from the Real World,” is available at amazon.com. Wayne Greenhaw’s, “Flying High: Inside Big-Time Drug Smuggling,” involves the fascinating tale of The Company and draws from Don Corrigan’s long tale that appeared originally in St. Louis Magazine in June of 1982. The article on the billion-dollar marijuana import business remains one of the longest pieces ever run in the city magazine. The story is about three Metro East boys who decided to go into the drug business after two returned from service in Vietnam. They bought trucks, airplanes, air fields and bribed law enforcement officials and politicians. “It’s no big deal identifying a plane coming back from South America loaded with marijuana. You can take a look at some of them and figure out they’re carrying something. The trick is to catch them while they’re loaded, to catch the planes on the ground while they’re unloading.